Amish Bird-Shaped Hanging Feeder - Choose Your Bird! Birdsong is as deeply woven into our memories of summer as iced tea and sunshine, and there's nothing like an Amish handmade bird feeder to bring the singers to your yard! The United States is home to hundreds of species of singing bird, each with its own preferred food and migration pattern. By choosing the right kind of feeder and the right kind of food, you can ensure that your garden is the place to be when your neighborhood's singers arrive. 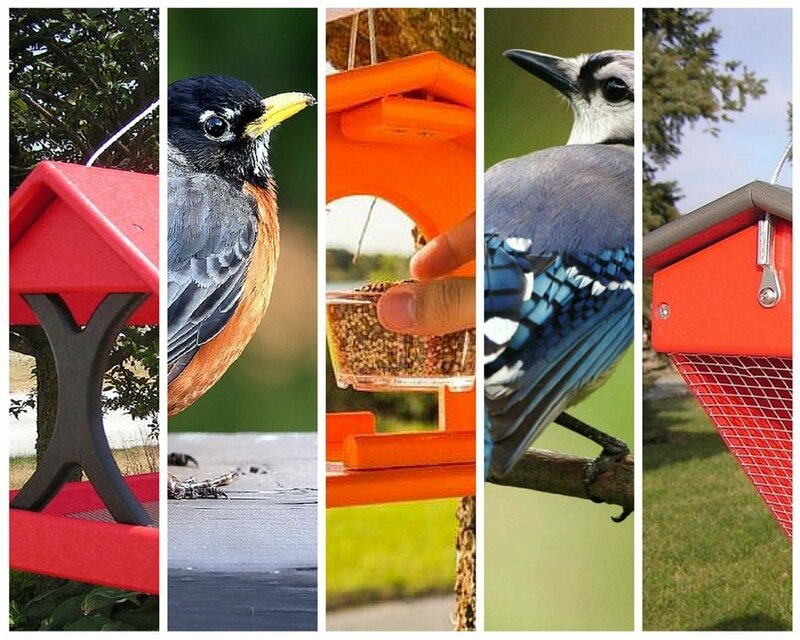 Our feeders come in a wide array of shapes and sizes, each specialized to a different group or species of bird. DutchCrafters is also proud to offer a wide range of handmade poly feeders in addition to our more traditional wooden feeders. Click here for a quick guide to the differences between the two. So, which feeder is right for your outdoor space? A tray feeder is a good general choice for all sorts of birds, be they big, small, singers, or the quiet types. You can also leave just about any food in your tray feeder, attracting as wide a variety of species as possible! However, if you've got bigger birds nearby like ravens or crows, they might take advantage of their size and scare smaller songbirds away from an open tray feeder. To get all of the utility of a tray feeder without this risk, choose a covered feeder or a Hopper Feeder from our wide selection. Suet - a variable mixture of seeds, nuts, grains or fruits held together by fat - provides most of the nutrients that wild birds need to thrive. Suet bird feeders or tray feeders with suet cages are specifically designed to hold this ever-popular treat in place and make sure that your birds only get a mouthful at a time. This all-in-one food solution is most popular with smaller songbirds, so choose a suet feeder if you're trying to bring wrens, bluebirds, chickadees and other smaller species to your summer paradise. These clingy species like a challenge - don't be afraid to make them hang sideways or upside down to get their meal! We offer some bird feeders that are a combination of a seed and suet feeder which attracts all types of birds for a feast at your new feeder. The goal with a peanut feeder is not just to bring birds to your garden, but instead to get them to stay! Peanut feeders - available in sizes suitable for shelled and unshelled peanuts - present small birds with the challenge of figuring out how to get the peanuts out of the cage without dropping them. Birds also go crazy for peanut butter! A peanut butter feeder provides a specifically-designed space for a jar of peanut butter and will hold the jar steady against the waves of birds sure to fly in to take a shot at its contents. Things get especially interesting when there's only a little butter left in the bottom of the jar and the birds have to start venturing into the jar itself to get a taste. Some of the USA's rarest songbirds, including orioles and hummingbirds, prefer to take their lunches in liquid form. These unusual and exceptionally beautiful birds are attracted to sugary foods like nectar, fruit, and jelly, and our Amish craftsman offer a wide range of jelly jar feeders that are designed specifically to cater to this sweet tooth. While a jelly jar feeder is a great bet for these choosy songsters, they'll also be very happy to pick apples, oranges or pears from one of our fruit feeders. Now that you've got an idea of the kind of bird feeder that's right for your space, you're ready to go! Simply click here for our DutchCrafters guide to easy-to-make, crowd-pleasing recipes for your bird food! Each of our recipes is designed to be easy enough for even kids to create with a little supervision and guidance from an adult. And don't worry - each and every one of our feeders is made from American materials in Amish woodshops in Ohio, Indiana, and Pennsylvania. These workers support their local communities in the same way they always have, with their commitment to quality and the pride they take in their work leading them to create pieces that last decades longer than anything else on the market. Each of our handmade bird feeders has a story, and it's a story that begins at home. So, gather the family and get ready to fill your garden with birdsong - summer is calling! Order one of our many American made bird feeders or bird house. You can reach one of our birding specialists at 1-866-272-6773. Shop our wide variety of wood birdfeeders, poly bird feeders, seed feeders, suet feeders, decorative bird houses, poly bird houses, fence mounted bird houses, squirrel proof feeders, pole mounted bird feeders and hanging feeders all proudly Amish made in the USA!